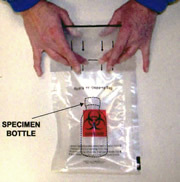 Specimen transport bags are liquid tight and tamper evident. The patented adhesive closure and continuous seal meet or exceed standards of all major air carriers and DOT. 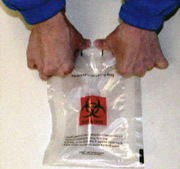 Polyethylene construction and adhesive closure provides added security during handling by personnel. Specimen shipping bags in this carton are designed to perform at high internal pressure, should an airliner lose its cabin pressure. 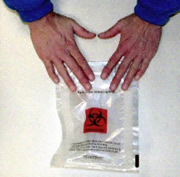 So, in order for the bag to be effective and perform to its design capabilities, the bag must be closed properly after insertion of the specimen. Step 1: Lay bag flat on counter with tape side up and tape end towards you. 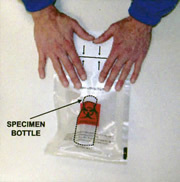 Step 2: Place specimen at bottom of bag. Flatten area above specimen before folding tape over. Step 3: Remove paper covering adhesive. 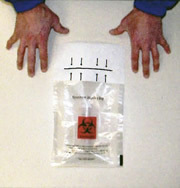 Place thumbs under the bag ends with middle fingers lightly holding the adhesive at the middle of the bag, below the slit opening. Step 4: Fold top over bag at the slit opening while thumbs press the folded end of the bag. Step 5: With both middle fingers, press adhesive together, starting at the center of the fold and work outward. Be sure to firmly press the entire adhesive area, especially the folded edge and corners.